For all your outdoor heating needs, Blue Rhino offers a wide array of products from family dinners to company picnics and more! Outdoor Firepits are the perfect complement to your Outdoor Living Space. 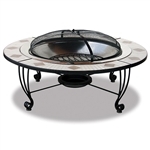 Enjoy the outdoors year round with our selection of Firebowls. Does not require a gas tank or electricity. Outdoor Firebowls provide the warmth you need on cold winter nights. Does not require a gas tank or electricity.